It was a "yapping" noise that first caught the attention of Wayne Komoski and his wife. 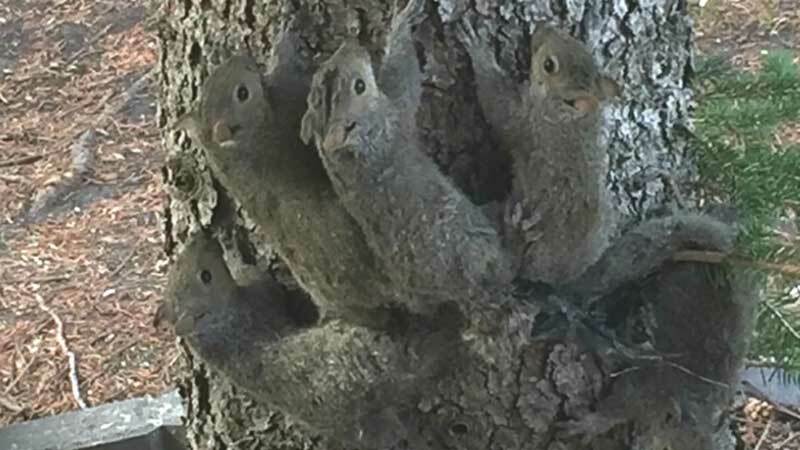 At first, the couple from the Charleswood suburb of Winnipeg in Manitoba, Canada, thought they had stumbled upon a nest of baby squirrels, but when they looked closer, they realised what all the commotion was about. "They were trying to get apart, and they couldn't," Komoski said. All five baby grey squirrels were tangled by their tails at the base of a tree, and a piece of black garbage bag was tightly wrapped around their tails. Komoski said he tried everything he could to safely separate the rodents without getting bitten. "They were sort of like, wanting to nip you," he said. Komoski first tried cutting the black plastic to free the rodents. "You had to be careful where you put the scissors, that's how tight it was," said Komoski. "Then my wife got some cooking oil and tried to spray it on their tails so they would slide out, but it didn't work." Komoski then decided to take the animals to an expert. Using a towel, he managed to trap the five squirrels in a box. He then delivered the animals to the Pembina Veterinary Hospital, where they were separated. All five are now in the care of the Prairie Wildlife Rehabilitation Centre where they are being fed and monitored, said the organisation's president Lisa Tretiak. The squirrels likely got tangled while they were growing up in the nest, she said. The five squirrels will remain at rehabilitation centre for the next couple of weeks to ensure their tails are not permanently damaged. "We have to see how the blood flow is going to go through the tail," said Tretiak. Grey squirrels cannot survive without their tails as the rodents use them for balance and for warmth in the winter, said Tretiak. If they are healthy, all the animals will be released back into the wild. Also, "Grey squirrels cannot survive without their tails." Not exactly true. There've been several squirrels in my neighborhood who have lost parts of their tails and managed to survive afterwards.